With the growing popularity of DOOH media, digital signs seem to be springing up all over the place, though some locations offer more opportunities than others. Waiting rooms of any kind make an excellent place to put a display, just like train stations, departure lounges and bus stops, where you have a constant flow of people who have nothing to do other than wait. These areas have what we call “high dwell times”. People are often bored when they are waiting around, so a digital signage screen can easily become the only point of interest in an otherwise uninspiring and boring environment. Some dental practices have started taking advantage of this captive audience in their waiting rooms. 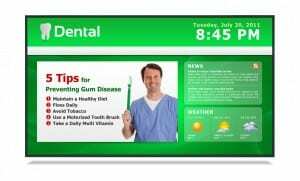 In this instance, digital signage can be used to give patients information about waiting times, clinic hours and procedures, as well as general advice on oral health and hygiene. Some dentists are even going one step further, by integrating elements of social media into their digital signage content. After all, everyone seems to be ‘going social’ these days, and many dentists now have their own promotional Facebook pages, so it makes sense for them to find a way of bringing this into their waiting rooms. Some dental practices have been taking the testimonials that patients have left on their Facebook pages and showcasing them on their digital signs in the waiting room. Showing these positive customer reviews and comments is a great way to build trust, which is useful for any business. Dental practices have also found that patients respond well to goods and services that are promoted via a combination of digital signage and Facebook. They are far more likely to make enquiries at reception and they want to find out more. Facebook founder Mark Zuckerberg has revealed that Facebook now has over 1 billion users. With so many people connecting, businesses can’t afford to miss out on the marketing potential of this platform. If you combine this with digital signage, you have a very powerful marketing tool indeed.